We invite you to join us as we build a community defined by our adherence to halacha, our love of God and mitzvot, compassion and justice. We hope you will find an inclusive and inspiring home at BDJ—one that is open to all who enter our doors. It takes a Jewish village to make B’nai David-Judea thrive. We recently launched our volunteer pledge campaign for the year and want to remind you to do one thing to make B’nai David-Judea better! Our success depends on each of us contributing our talents and passions. I encourage you to help us nurture our community. 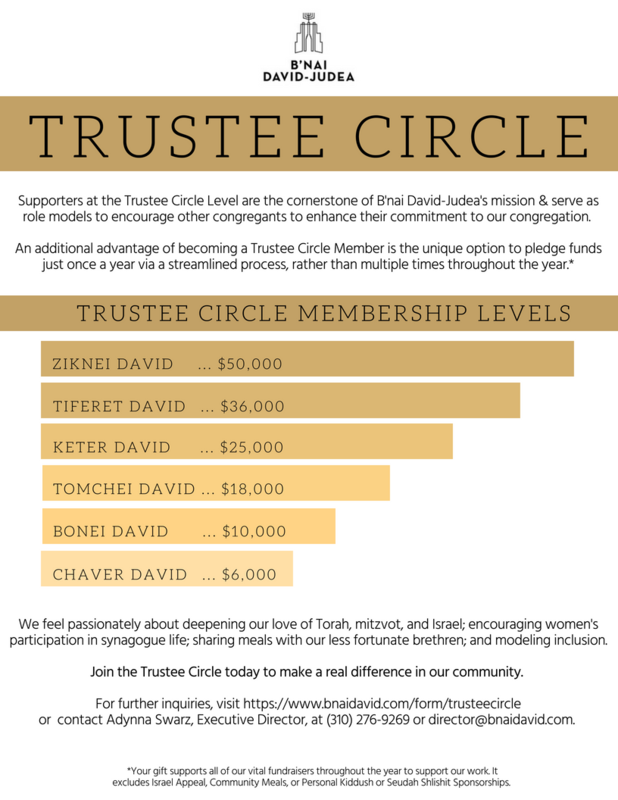 Supporters in the Trustee Circle are a cornerstone of B'nai David’s mission, providing essential support for our shul while encouraging others to enhance their commitments as well. One advantage of becoming a Trustee Circle member is the unique option to pledge funds once a year via a streamlined process rather than multiple times throughout the year. See below for more information about Trustee Circle membership. Please submit all forms by mail, in person or online at www.bnaidavid.com/membership5779. Forms are due no later than August 8, 2018. Please note that submissions after this date will incur a 3% late charge. To learn more about BDJ, please contact us at hello@bnaidavid.com. Includes access to our entire calendar of events and educational classes, 2 High Holiday seats, and year-round youth programming (high holidays are additional). Includes access to our entire calendar of events and educational classes, 1 High Holiday seat, and year-round youth programming (high holidays are additional). A special rate for our younger members under 30. First three years of membership ONLY. Single rate is $300, couple is $500. Includes access to our entire calendar of events and educational classes. Includes 1-2 High Holiday seats. For those who generally daven elsewhere but who want to be associated with BDJ. Includes access to our entire calendar of events and educational programming. Does not include High Holiday seating. First year of marriage free. Does not include High Holiday seating. Does include access to our entire calendar of events and educational programming as well as our weekly Rechov Yeladim program (high holidays are additional).